Hands 2 Grow offers your church, school, or Christian organization a wide range of skits and programs. Whether it's a stock show or a custom program created just for you, we are dedicated to meeting your group's needs. No matter what the occasion, it's our pledge to work with you to create the best learning experience for all involved. Hands 2 Grow stock programs include a 20-30 minute performance around a single theme. 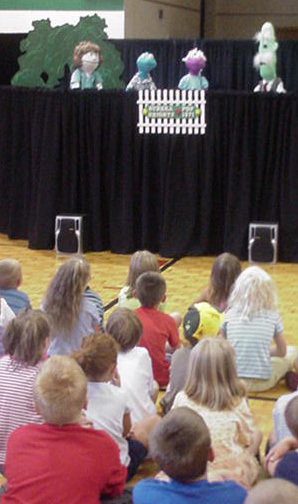 Performances include 2-3 puppet skits, a puppet song, and audience interaction sections. Our stock programs include . . . Hands 2 Grow programs are especially popular during the holiday seasons as many churches offer Christmas for Kids and Easter for Kids events. We have a variety of 20-30 minute programs that we have performed over the years. Current programs include . . . Hands 2 Grow skits are always a hit at VBS - and a great way to highlight the Bible stories being taught that week. Whether it's a kick-off event, finale, or daily devotion, Hands 2 Grow puppets will be hit with the kids and do a great job reinforcing your VBS theme. Over the years, we have created programs that include . . . Custom programming is a way the Hands 2 Grow team can create a presentation to fit your special ministry needs. It's also a great way to expand presentation time to fit longer time requirements. Hands 2 Grow has over a hundred skits in our repertoire. Chances are -- if you need it, we've got it. Contact us via e-mail or on the phone to find out more about how we can create a program just for you!